Francisco “Frank” Martinez was born in San Luis Potosi, Mexico. He grew up in a small, rural town along with his eight brothers and four sisters. At the age of nine Francisco migrated to Edinburg, Texas a town located in the lower Rio Grande Valley. He has lived in Edinburg since then. Francisco graduated from the University of Texas Pan American with a degree in Graphic Design. He frequently uses studio art to create digital art. His deep Mexican roots inspire him to use a multitude of colors and media for his work. 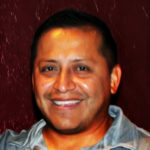 Francisco works as a free-lance artist and graphic designer while teaching private art classes. In this hands-on, live-instructor led class students will learn the basics of adobe photoshop software. Students will learn how to manipulate layers, colors, and digital images. Students will be engaged through fun-filled projects such as antique photo restoration, birthday card creation, and digital illustrations. If you have been wanting to learn how to combine your studio art skills with digital art, then this is the class for you. Students must provide their own laptop/computer with adobe photoshop (a free trial version can be obtained at https://www.adobe.com/ ). Accommodations can be made for those that do not have laptop or software. Seating is limited so please sign up early.